Indian official: Humanitarian crisis "building up with every passing day"
NEW DELHI, India (CNN) -- India has called for a "pause" in the fighting between Sri Lankan forces and Tamil rebels to allow the evacuation of thousands of civilians trapped in the nation's northern war zone. 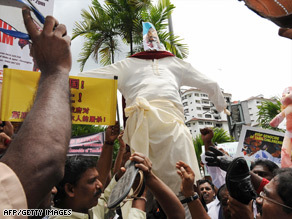 Ethnic Tamils beat an effigy of Sri Lanka's Prime Minister with shoes in front of the U.N. office in Kuala Lumpur. In a statement issued Saturday, India's external affairs minister, Pranab Mukherjee, warned that the humanitarian crisis was "building up with every passing day" in Sri Lanka. Mukherjee referred to the recent rebel offer of a cease-fire as an "opportunity" for the Sri Lankan government to stave off the crisis. "While this (the cease-fire proposal) may fall short of a declaration of willingness to lay down arms, it is our view that the government of Sri Lanka should seize the opportunity presented by the offer to bring about a pause in the hostilities," Mukherjee said. Mukherjee said a civilian evacuation would require cooperation by the Tamil rebels as well. There are reports of more than 70,000 civilians trapped in the war zone. Fighting is occurring in the Mulaittivu region. Mukherjee said people are dying, and there are shortages of food, water and medicine in the war zone. He said India is working on sending an emergency medical team and medicines to the internally displaced people in the north. "The pause in hostilities must be utilized to facilitate the movement of Tamil population out of the war-affected areas to secure locations where proper rehabilitation is possible, and international aid organizations ... have free access and scope to provide medical and other forms of humanitarian aid," Mukherjee said, using the International Committee of the Red Cross as an example. The Tamil Tiger militant group has fought for an independent Tamil state since 1983. The Sri Lankan military has recently made gains against strongholds of the group, officially known as the Liberation Tigers of Tamil Eelam. Mukherjee said Sri Lanka should also carry out what he called "a proper devolution of powers to the provinces," after shifting war victims to safe locations. He called for "assurances of equality and equal rights to all citizens, particularly the Tamil people, within the constitutional framework of Sri Lanka maintaining its territorial integrity."